The Danube Delta formatez the zone with the lowest attitude on the romanian territory, being a plain in formation threw deposits of mud. The dry zones, at the usual level of the river represents aprox. 13%, the biggest part of the Delta is covered in morasses and lakes. An amazing image is making the exotic view. this being a real natural reservation where lives together several hundreds of species of birds, the viewed an studied zone and the famous french scientist Jacques Cousteau. 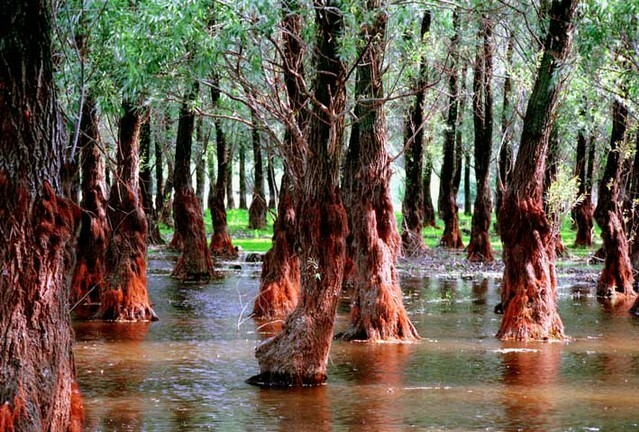 The main wealthiest of Danube Delta are: the forests and the bushes especially the silky essences. 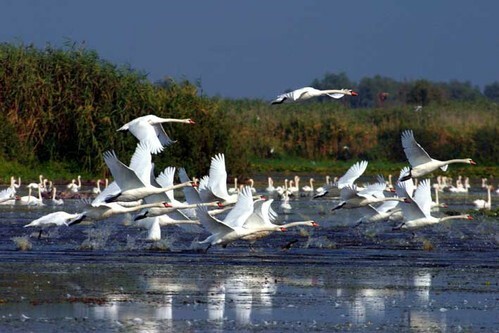 In the view of conservation of the flowers and specific faunes, this zone of delta formates in this moment the Biosphere reservation of Danube Delta. The Danube Delta crosses our country for a distance of aproximative 1000 km, being favorable for the navigation on all his range, and he has as tributaryes from the Tisa river, all the romanian rivers. The rivers that pours here get to the 3 arms of Dunare in the Black Sea that makes the hydrographic network of the country and makes easy the acces to the Planetar Ocean. Letea Forest is situated between Chilia and Sulina arms, famous as a natural reservation. In the depressions betwen the dunes grows a wood vegetation build-up by many trees species. At the originality of the forest contains the multitude of crowing plants. Here, many animals had made a warm shelter; vertebrates and nevertebrates, many of them being nationality unicated, europene, even mondyales. GGGociman gives you the unique opportunity to admire Tulcea and the Danube Delta from a ship, as it is a floating hotel providing the utmost luxury, superb facilities and services. There are numerous possibilities how you can spend your time - fish aboard, soak up the sun on the terrace, party with your friends and watch local fishermen throwing their nets. You will be delighted by the comfortable and pleasant ambience, with an elegant restaurant seating 20 guests. It is equipped with a SAT TV and a PC with internet access and other facilities, making it perfect for organising all kinds of events.